Quito is the capital of Ecuador. It was 1994, and I recall the three star hotel I had booked was a bit rough compared to what I had expected. The morning market stalls, filled with all sorts of unfamiliar produce, seemed to crowd out the sense of sidewalks. But that market’s daily disappearance with a lack of any trace by 9am left me feeling even more disconcerted. With that backdrop, I was relieved to find the people in the hotels, restaurants,and shops were very gracious to this lone female traveler. I had worked diligently on my Latin American Spanish tapes, and the locals seemed very appreciative of my efforts. Like any capital city, there were the historical areas and the crowded shop areas. I recall the Old Town had lots of people and narrow sidewalks and narrow streets which made for an exciting walk about. Like many places, people were dressed up more than you are apt to find on the streets of the USA. The men mostly wore suits and the women mostly wore dresses. (Unlike the subdued tones of the locals’ clothing, I was wearing a yellow denim jacket.) Quito was the first big city I had ever visited with a huge holy statue on a hill. The Virgin de Quito stands over 100 feet high, and I thought it looked like an angel. The Catholic Church seems to have a strong influence on the government. The Church there says the soul of the deceased lives for ten years after the body dies so it is illegal to cremate a corpse before it is ten years old. At that time, the family is notified to retrieve the corpse or it will be cremated. Having deceased loved ones, I thought that was a horrible way to do things. For me, it would have re-awakened heart ache. But maybe it’s good to revisit after ten years. In January 1994, the International Monetary Fund was applying pressure on the government to double the cost of gasoline. Ecuador produces its own oil and the city populace was in an uproar that their fuel costs were about to sky rocket to appease these international bankers. Riot police were lined up around some of the main squares. The riot police were in white metal armored suits so that they looked like Star Wars stormtroopers. But we were on planet Earth, and I kept walking quickly as the riot police threw tear gas into crowds of peaceful protesters. Drawn to that surreal Star Wars look, I stopped to ask the white armored people for directions and they were pleasant, but I heard them muttering “Americana” to each other as I walked away. I couldn’t tell whether that was commenting on my accent or my yellow jacket. In a section of town without any visible riot police, I saw a group of eight men marching. They wore red coats and carried long red banners; one played a horn and one played a drum. It is my understanding they were encouraging people to vote for the red candidate. Ecuador has two main political parties but a total of 20 political parties. Each party has a color and a number for identification on the ballot. Voting is mandatory from age 18 on up. Failure to vote can lead to economic sanctions against the individual making it difficult to work or cash a check or borrow money. Maybe it is that enforced voting that energized people. But the level of political involvement appeared admirable. 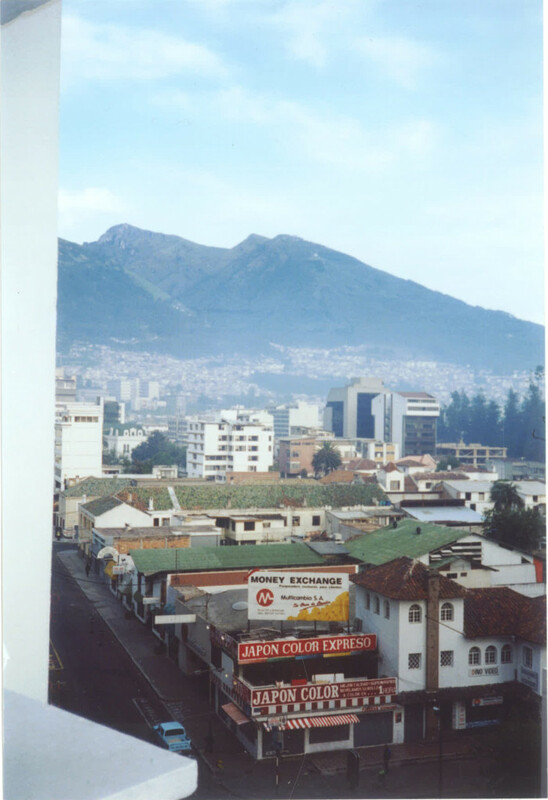 View from Quito hotel room; I suppose that rates three stars. Click here for more on Equador.